Winter approaches and we’re dreaming of softly flickering hearths and wood burners that calm all who enter the toasty and welcoming interiors of today. Whether you see yourself as a Scandi ‘whites & brights’ nester, are often star-struck by twinkly grandeur, or revel in the rather rustic, log cabin look, there is nothing like allure of a log burner or revived open fireplace. Wherever your fire is burning and whether it’s a log burner or open fire, it’s a good idea to guard it from inquisitive or boisterous pets, children and even unsteady adults. To this end, we think you’ll be comforted to hear about Garden Requisites’ latest stylish twist on the traditional fireguard. Warming up? If you’re getting in the mood for cosy fire-lit winter interiors inspiration then these emotive home fire visuals on Pinterest do burn bright in the mind. While you’re there, do settle in to our own, more evocative than you would think (! ), contemporary fireguards pinterest board. Garden Requisites has been handcrafting Victorian Nursery-style wirework fireguards for some time now and the team has noticed an increasing need for our well-made, sometimes bespoke, sturdy screens. The traditional design is extremely popular with period property owners and we are now very proud to also present a more minimal fire guard with sleek, vertical bars for pared back, modern interiors. The guard bars have even been carefully spaced with the cat’s whiskers in mind. That’s attention to detail! The new Contemporary fireguard design comes in two sizes for small or large fireplaces and can also be specifically tailored to wrap around protruding wood burning stoves or in better fitting dimensions for awkward spaces. 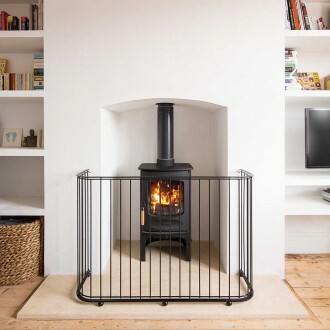 The resulting look, especially with wood burning stoves, is that this ‘designer’ fireguard is an intrinsic well-designed element in its own right, rather than a ‘stuck-on’ safety solution. It fits beautifully in contemporary interiors of all types. Measure up and choose a finish. Now where’s that tape measure? If in doubt about measuring up and the possibilities, do give Hilary & team a call. All Garden Requisites’ fireguards are corrosion resistant, forged in our workshop near Bath from solid steel and hot dip zinc galvanized with three finish options to choose from. We’ve also included steel ball feet to solidly ground the guard. Whether your fire is lit in an open fireplace, log burner or as a built-in gas fire – all will look the business this winter and bring peace of mind where safety is concerned. Welcome a new-look Contemporary fire guard that’s more pleasingly part of the furniture and light those fires!